Investigators: Rob Johnson, David Schumacher, Deb Skinvik, Jennifer Lauer, Alicia Sanders, Chris Carter. Sper Scientific Electromagnetic Field Test 840025 EMF meter. Bandwidth is 30 to 400Hz with 4% accuracy at 50Hz/60Hz. Data is displayed as mG., Air ion Counter. Positive and negative ion counts are displayed as ions/cm3., Sony Digital Handycam DCR-TRV19 NTSC with night shot., Automated Data Collection System (ADaCS), Triaxial ELF magnetic field meter with pc interface. The meter has a bandwidth of 30Hz to 2000Hz and an accuracy of +/- 3% at 50Hz/60Hz and +/-5% at 40 to 200Hz. Data was logged using the supplied software., HOBO Temperature data logger from Onset Computer Corporation with data logging and archiving ability. Software (BoxCar Pro 4.3) provided by Onset Computer Corporation was used for data logging and archiving., GM-10 radiation detector from Black Cat Systems with pc interface. 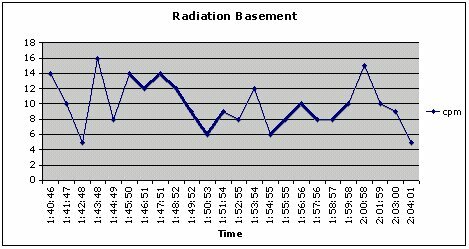 The Radiation Acquisition and Display (RAD) Software was used to log and archive the data. Radiation detected includes alpha, beta, and gamma/x-ray. Data is displayed as counts per minute (cpm)., Panasonic Toughbook CF-45 laptop computer. CAUSE FOR INVESTIGATION - Our group has been in contact with the owner, B.C. Farr for over a year researching the history and hauntings of this 141 year old Saloon. Mr. Farr told us stories of a woman named Mary, whom they believe is the resident ghost of the Old Baraboo Inn. Mary was a prostitute at the Inn back in the 1800's when it was a brothel and she died in the building. What Farr has seen includes dishes flying off a rack, a floating broom and doors opening and closing on their own not to mention a huge laundry list of other interesting haunting characteristics came up. They even have, what they believe is a photo of the ghost, framed and hung up behind the bar. After scheduling an official investigation with Mr. Farr and the Baraboo Chief of Police, we finally were able to conduct a full investigation. 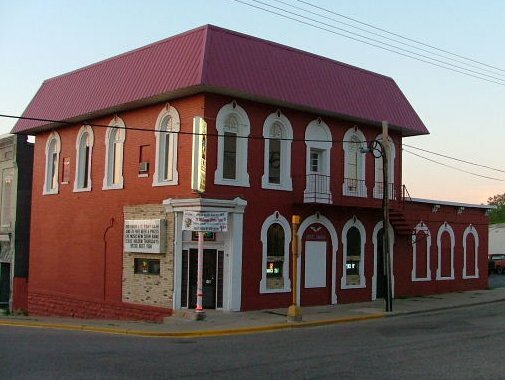 THE HISTORY - The Inn is a former tavern and brothel, located across from the site of the old Baraboo train depot. Baraboo once was a railroad hub between Minneapolis and Chicago. A prostitute named Mary reportedly bled to death in the building around the early 1900s. Several other people have reportedly died in the building, including two former owners. THE INVESTIGATION - Since our group is currently talking to the owner about conducting a second investigation, we will only post our initial data collected at the first investigation. No definate conclusions can be reached at this time. 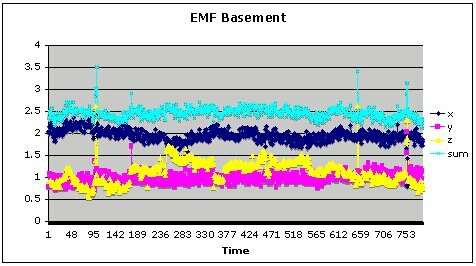 The EMF background of 5.5mG is relatively high. Normal background levels are usually within the 1 to 2mG range. There was an EMF 'spike' of 5.872mG. There were 'spikes' in the natural EMF of 22uT, 9uT, 4uT and a cluster of 'spikes' between 12:23am and 12:35am. The increase in the z-axis EMF field follows a cluster of 'spikes' in the natural EMF. There was nothing to note in the radiation readings. There was an increase in dew point and humidity at 12:32am. This could have been caused by the deep fryer being used. The area by the sink legs gave readings between 1800 to 2000mG and the field was reversed. This is in the same general area where the owner has a picture with anomaly. Normal levels in areas with no reported paranormal activity range between 400 to 500mG. Background ion counts were +/- 300 to +/-500 ions/cm3. Ion counts by the sink legs were +1500 to +1800 ions/cm3 and -300 ions/cm3. 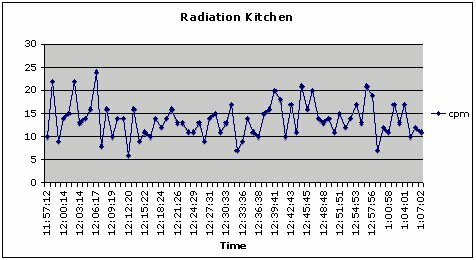 Normal levels of ion counts in areas with no reported paranormal activity range between +/- 300 to +/-500 ions/cm3. 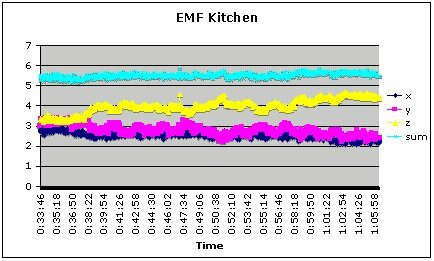 'Spikes' in EMF correlated with 'spikes' in the natural EMF. 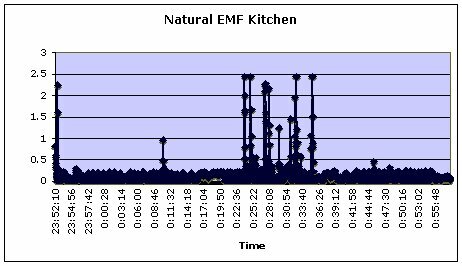 However, not all natural EMF 'spikes' led to 'spikes' in EMF. 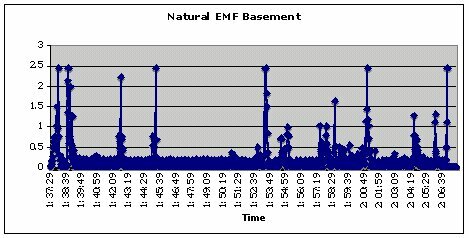 An increase in the EMF z-axis between 1:47am and 1:51am correlated with a transient decrease in radiation during the same time period. 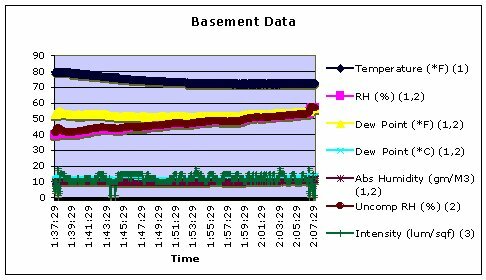 There was a gradual decrease in temperature and a gradual increase in dew point and uncompromised relative humidity during the monitoring period. This could be due to the many individuals entering and leaving the room. The background readings were 300 to 600mG. 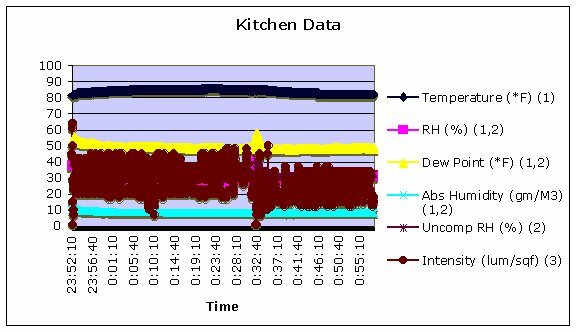 The area directly under the kitchen gave readings between 1000 to 2000mG. The area under the arch by the walk-in cooler gave readings between 1000 to 1200mG. There were two small areas around the metal shelves were the polarity was reversed. The polarity was reversed in the walk-in cooler. Normal readings in areas were there is no reported paranormal activity give readings between 400 to 500mG. Background ion counts were between +/- 300 to +/-500 ions/cm3. Ion counts in the walk-in cooler were +1500 ions/cm3 and -400 ions/cm3. The area by the water softner gave readings of +1500 to +2000 ions/cm3 and -400 ions/cm3. Ion counts in areas with no reported paranormal activity range between +/- 300 to +/- 500 ions/cm3.